The Art of Fabric Collage - Laura Heine's "Flaura"
Skill Level: Some quilting experience is desirable. You will primarily be working on collage design and techniques in class. Outside of class, you will need the skills to stitch the large pieces of the background together and layer, quilt and bind your finished collage piece. 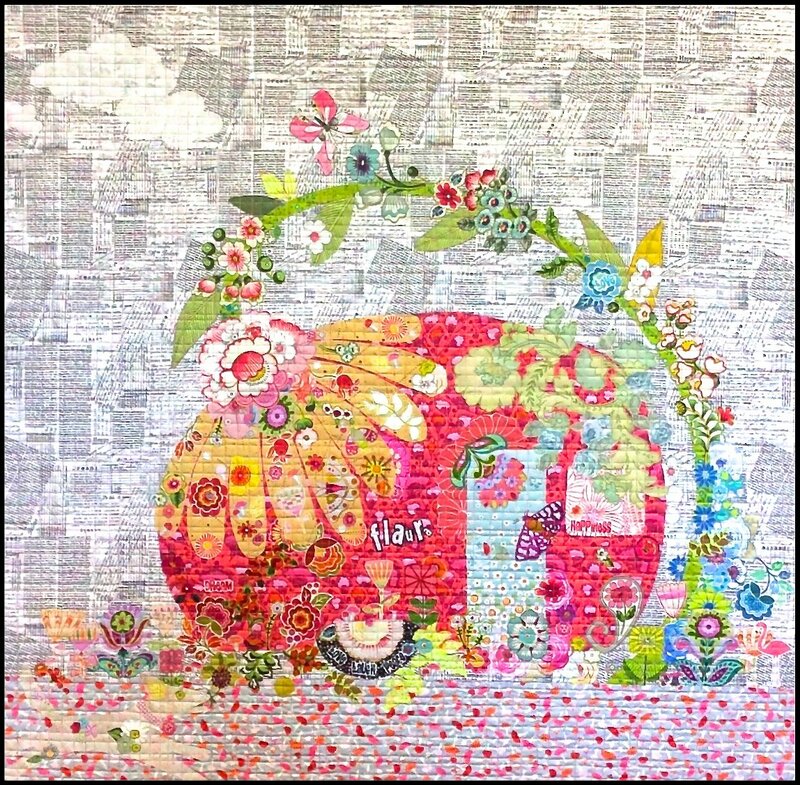 Class Description: Have you admired Laura Heine’s wonderful collage patterns but assumed you weren’t “artistic” enough to create one of your own? You would be surprised how easy it can be, to create your own masterpiece using one of Laura’s most whimsical patterns. All you need is a playful spirit and a bit of guidance from our very own Ruby Street Collage Artists. Using Laura’s charming “Flaura” pattern, Shelley and Beth will teach you the basics including Laura’s creative fusible applique collage construction techniques and their own fabric selection hacks. In the introductory, evening session, you will learn how to “read” the pattern with an artist’s eye and seek out fabric that will bring your own vision of “Flaura” to life. In between classes you will piece together the simple collage background and continue the search for the perfect fabric for your collage details. In the Sunday Class you’ll start constructing your collage with guidance from Shelley and Beth. Scraps or 1/8 yard cuts of many large and medium scale prints for collage. You won’t need a sewing machine in class but you will need access to one. You will be piecing the large background pieces and finishing your quilt (layering, quilting and binding) outside of class. Your sewing kit with your favorite sewing notions: fabric shears, thread snips or scissors, marking tools, straight pins, basting pins, etc. You can reserve a spot in this class with full payment of the class fee. If you are not able to attend the class, please notify us as soon as possible so your space may be offered to a student on the waiting list. A full refund will be made in the form of a store credit, which may be used towards another class or any purchases in the shop, so long as you notify us at least 5 days in advance of the first class date. While attending class, we kindly ask that you park against the chain link fence or on the street alongside the shop. There is also an additional parking lot just across the street from our back door. This kindness will allow access to patients of the chiropractic office and other businesses in our building. Of course you are welcome to pull right up to the door for unloading. Thank you for understanding.